Cordyceps sinensis (CS) is a traditional Chinese medicine and health food used to support many organ systems. It is commercially produced by cultivation in a liquid medium or on a solid (grain/potato) phase. We tested the effects of hot water extracts of liquid-phase and solid-phase commercially grown CS on its ability to influence proliferation (using Alamar blue, an oxidation/reduction indicator), migration (serial-wounded monolayer photomicroscopy), invasion through collagen gel (fluorometric assay) and indomethacin-induced apoptosis (active caspase-3 colorimetric assay) of human colon cancer HT29 cells. An in vivo study used a rat gastric damage model (indomethacin 20 mg/kg and 4 h restraint with oral administration). The CS extract stimulated cell proliferation threefold when added at 10 mg/ml (P<0.01). Cell migration increased by 69% and invasion by 17% when CS was added at 5 mg/ml (P<0.01). The results also showed that 93% of the pro-proliferative activity was soluble in ethanol, whereas pro-migratory activity was divided (61:49) into both ethanol-soluble and ethanol-insoluble sub-fractions. 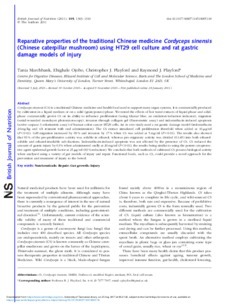 Indomethacin-induced apoptosis was not affected by the presence of CS. CS reduced the amount of gastric injury by 63% when administered orally at 20 mg/ml (P<0.01), the results being similar to using the potent cytoprotective agent epidermal growth factor at 25 mu g/ml (83% reduction). We conclude that both methods of cultivated CS possess biological activity when analysed using a variety of gut models of injury and repair. Functional foods, such as CS, could provide a novel approach for the prevention and treatment of injury to the bowel.